Welcome to InVestaGate, the classroom unit about asteroids, comets, meteoroids and other small bodies in the Solar System, as well as meteorite impacts, mining asteroids, and more! This unit features the citizen science project Asteroid Mappers: Vesta Edition so that you can bring real NASA science into your classroom. This unit is also aligned with the Next Generation Science Standards and the Project 2061 Benchmarks for Science Literacy. Each day of the unit follows the 5E model of instruction. You can take the unit as a whole or pick individual days and activities to cover in your science classroom. Designed for middle school students, many of these can be scaled up or down depending on age or adapted for use in informal education settings. Solar System Formation (pdf) (docx) – Students will construct a model to show the process of accretion in solar system formation. The Role of Gravity (pdf) (docx) – Students will analyze the affect that gravity has on falling objects, and explore the role gravity plays in the formation of solar systems. It’s Not a Planet? (pdf) (docx) – Students will classify various objects in the Solar System as planets, dwarf planets, or asteroids. Asteroids, Comets, and Meteoroids (pdf) (docx) – Students will differentiate between asteroids, comets, and meteoroids. Observing Asteroids (pdf) (docx) – Students will use observations of light, heat, and metals, and then use that information to interpret the information that scientists collect about asteroids. Asteroid Cratering (pdf) (docx) – Students will model the process of cratering in the Solar System and use this information to interpret impact crater features on asteroids. 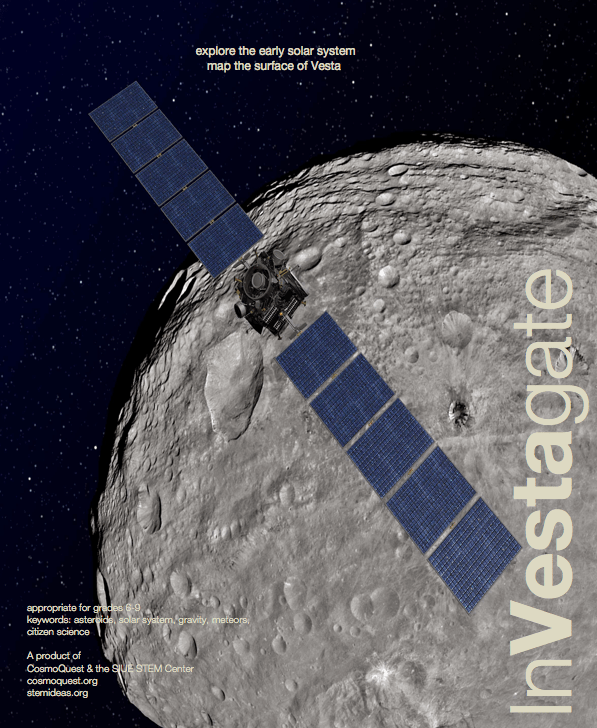 Mapping Vesta (pdf) (docx) – Students will learn how to map craters at the CosmoQuest website “Vesta Mappers” and participate in a citizen science project. Expedition Asteroid Part 1: Landing on Vesta (pdf) (docx) – Students will use engineering practices to design, build, and test a device that meets specifications for a vehicle that will land on a target. Students will compare engineering practices with science practices. Expedition Asteroid Part 2: Mining Vesta (pdf) (docx) – Students will use engineering practices to design, build, and test a device that meets specifications for a device that will separate a mixture of materials into their component parts. Students will identify the natural resources found on asteroids that are important for space travel. Expedition Asteroid Part 3: We Deliver! (pdf) (docx) – Students will use engineering practices to design, build, and test a device that delivers a payload to a target. Students will list the possible benefits and possible impacts of mining an asteroid. The Universe is Out to Get You (pdf) (docx) – Students will learn how meteorites get to Earth from the asteroid belt and how rare it is for Earth to be hit by a large asteroid. They will observe relative distances and sizes within the inner Solar System and gain an appreciation of the large amount of empty space in the Solar System.